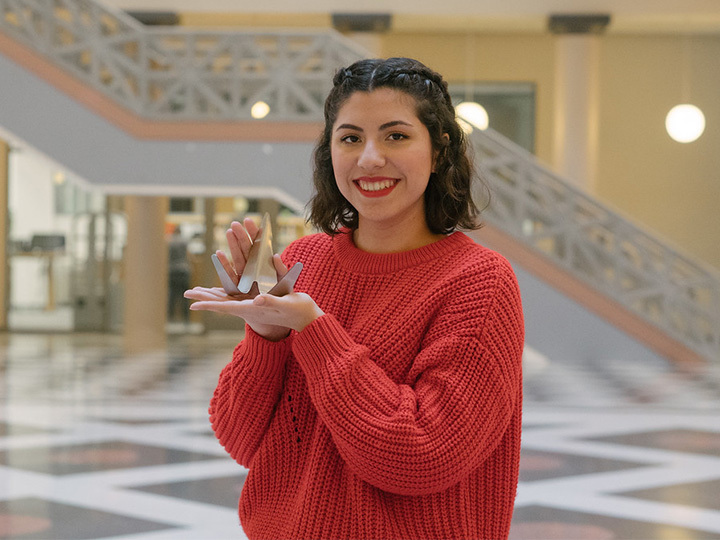 Industrial design student Alexa Baeza will try to sell "Flight," a wall hanger made out of stainless steel. Industrial design student Juliana Engler will try to sell "Keeper Bin," which can be used to hold grocery store bags as trash bags. 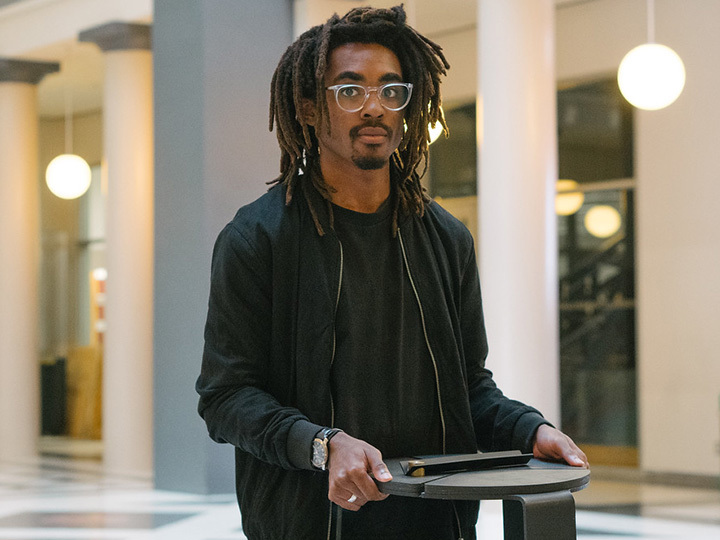 Industrial design student Imhotep Blot will try to sell his stool "Three" and incense holder "Two." It sounds like a reality television show competition: more than a dozen up-and-coming designers compete to bring new homeware and décor products to market. They’re tasked with everything from with working with local manufacturers to dealing with rejection from wholesalers and retailers. But this competition is real. The designers are sophomores in the Industrial Design program at the University of Houston Gerald D. Hines College of Architecture and Design, and they’re getting a notable opportunity to showcase their innovative creations in front of tens of thousands of buyers from around the world. In a first for the College, and with support from the William Stamps Farish Fund, students and instructors will sell their products at the Dallas Total Home and Gift Market in the Dallas Market Center Thursday, Jan. 17 – Sunday Jan. 20. The Dallas Market is one of the largest wholesale markets in the country with more than 200,000 retail buyers from more than 85 countries in attendance. Five UH-developed items will be ready and priced to sell, and 10 more will be on display for buyer feedback. The students’ projects involved identifying marketable trends, designing products and packaging, pricing out materials, sorting through the manufacturing processes and dealing with inevitable pitfalls that can arise from turning their concepts into finished goods. Industrial design student Alexa Baeza admits the process was stressful at times, but the lessons were invaluable. 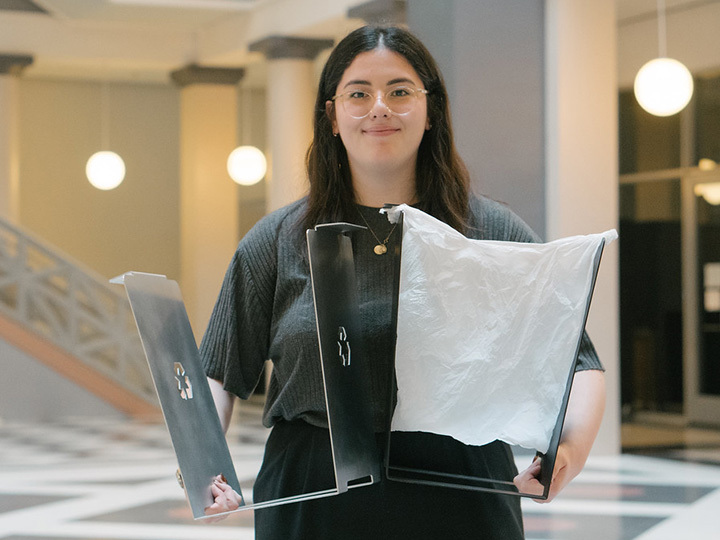 For example, she figured out a way to save on costs by laser cutting and bending her product “Flight,” a wall hanger made out of stainless steel that can hold items such as jackets, purses and pictures. Juliana Engler’s “Keeper Bin” is for people who collect plastic bags from the grocery store and try to use them on regular garbage cans. Most of the time, she said, they don’t fit. The “Keeper Bin” solves this problem with its extended edges for the bag’s handles. It’s made out of 12-gauge sheet aluminum, which is infinitely recyclable. Simplicity was the inspiration behind the two products Imhotep Blot designed. First is a two-piece incense holder called “Two,” a brass weight that holds the incense stick and an aluminum tray that catches the ashes. The other product, “Three,” is a stool made out of steel and wood that can easily be assembled for use and disassembled for shipping. Aside from hoping their products will sell, students said the buyer interest and feedback received during the Dallas Market exhibition will be priceless. “If we make money, 60 percent of the proceeds will go to the students and 40 percent will be reinvested in the industrial design program so we can repeat this opportunity next year,” Kimbrough said.